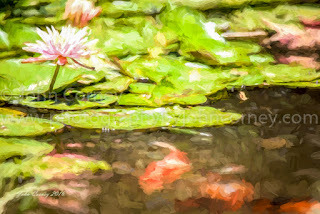 The pond in the gardens at the Huntington Library is a peaceful place to stop and rest for a bit and idly watch the koi moving slowly through the waterlilies. In the summer there are also lotus flowering in the pond with bright red dragonflies flitting about which is sight to behold. On Saturday I took some photos of the koi floating by in a break in the lily pads. I played around with this one until late on Saturday night and gave it a Monetesque touch. I hope you like it.